EzRor is a simple rails deployment script that takes care of all your deployment needs. Simply run the script, enter in a few info and see your app deployed in less than 30 minutes. We wanted to automate Rails deployment process. So we wrote a script. Let’s make your Rails deployment process trouble-free. It takes 30 minutes or less! You can clearly see what the script is doing at any point, but no input is required from you. 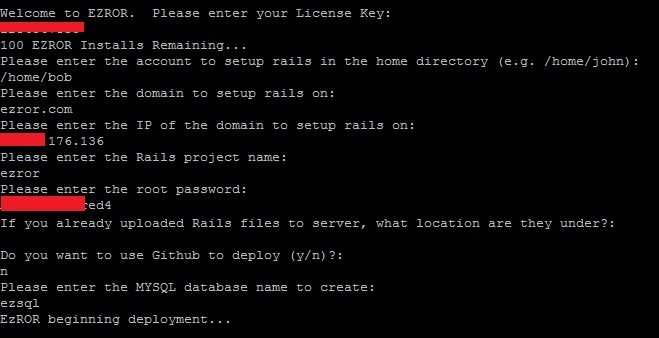 The script will install and configure everything you need to have a Rails app running. YOUR APP IS NOW DEPLOYED! Ruby on Rails: Ruby on Rails® is an open-source web framework that’s optimized for programmer happiness and sustainable productivity. MSpy: Mspy is a brand of mobile and computer monitoring software for iOS (iPhone, iPad), Android, BlackBerry, Windows, and Mac OS. Apache HTTP Server: The Apache HTTP Server is an open-source HTTP server for modern operating systems including UNIX, Microsoft Windows, Mac OS/X and Netware. Ubuntu OS: Ubuntu is an open source software platform that runs everywhere from the smartphone, the tablet and the PC to the server and the cloud.